To those interested in learning more about the Porter-Phelps-Huntington Family, you’re invited to a presentation about Frederick Dan Huntington titled, “Crossing the Heretic’s Bridge”. Ken Samonds will be presenting to the Grace Episcopal Church on Wednesday, September 26, at 7:00 PM. The title of the talk refers to a life changing incident that influenced his life-choices, career, and his faith at the age of eight. Frederick Dan Huntington is known as one of the founders of the Grace Church and some may remember that he was the donor of the east window. Only a few may know of other details of his national reputation or of his life-journey from a farm in Hadley to St. Paul's Cathedral, Syracuse, New York. We encourage anyone that is interested in the history of Hadley or the Grace Episcopal Church to come and enjoy this talk by Ken Samonds! HADLEY—The Porter-Phelps-Huntington Museum will be open for guided tours Saturdays, Sundays, and Mondays from 1:00 – 4:00 PM and closed Tuesday through Friday until the end of its 2018 season, October 15th. September 16, 2018- An Artists’ Reception, 2-4 pm, for FIELD NOTES 8, an exhibition of colorful mobile compositions, and wood bas reliefs created by architects Sigrid Miller Pollin and Stephen Schreiber, and landscape architect Jane Thurber. September 23, 2018- At 2 pm, the New England Mandolin Orchestra will premiere what it believes to be the first mandolin rendition of Wolfgang Mozart's Quartet #17, nicknamed "The Hunt," one of six string quartets he composed and dedicated to his friend and hero Franz Joseph Haydn, and a mandolin interpretation of a violin concerto by Johann Sebastian Bach. Admission is by donation and will be held in the Museum’s Corn Barn. The Porter-Phelps-Huntington Museum is located at 130 River Drive (Route 47) in Hadley, two miles north of the junction of Routes 9 and 47. The Museum is open for guided tours Saturday through Monday from 1:00 p.m. to 4:00 p.m. The house, which remains unchanged since the family’s occupancy, tells the story of six generations of prominent Hadley residents. The family, prosperous traders turned farmers, fought in both the Seven Years’ War and Revolutionary War, rose to prominence in local government, and embodied a consistently progressive social consciousness. Tours highlight both local and regional narratives, ranging in focus from architecture, material culture, and labor, to early American theology, economics, and social movements. The Museum is open for guided tours Saturday through Wednesday from 1:00 p.m. to 4:30 p.m. and by appointment. Tours are $5 for adults, $1 for children under twelve. For further information about tours or other programs, please call the Museum at (413) 584-4699 or visit us online at pphmuseum.org. On September 16th, 2018, The Porter-Phelps Huntington Museum will host an artist reception from 2-4 pm for Field Notes 8, a new installation of suspended collage and wooden bas reliefs created by architects Sigrid Miller Pollin and Stephen Schreiber, and landscape architects Jane Thurber. Guests will be able to meet the artists and view the installation which reflects rhythms found in the landscape and structures of Porter-Phelps-Huntington Museum. The exhibit will be on display through October 15, 2018 in the museum’s historic Corn Barn. Amherst-based artists Miller Pollin, Thurber, and Schreiber found inspiration in the details of the historic structures and farmland at the Porter-Phelps-Huntington Museum. Schreiber’s bas reliefs interpret the subtle, repetitive weaving of the surrounding fields and riverbanks, while Thurber and Miller Pollin’s suspended collage of shapes and colors creates a whimsical dialogue with the tectonics and the seasoned materials of the Corn Barn. Layers of painted paper strips suspended from the wooden trusses take inspiration from architectural details and patterns found in the Corn Barn. Together, the artists have composed a modern reinterpretation of the historic elements that define the museum and its grounds. Schreiber and Miller Pollin are professors of architecture, and Thurber is a lecturer in landscape architecture, all at Umass. Students Victoria Capaldo and Callie Kerkorian, assisted in the exhibition production. Due to weather forecast, the Porter-Phelps-Huntington Museum will relocate Wednesday Folk Traditions featuring Tim Eriksen to Wesley United Methodist Church at 98 N. Maple Street in Hadley, Massachusetts. The concert is on August 8, 2018 at 6:30 pm with Tim Eriksen, “widely regarded as the best ballad singer of his generation” (BBC Radio), performing modern interpretations of traditional folk songs from the Pioneer Valley and beyond. Visit the museum’s Facebook page, or call at 413-584-4699 for the most up-to-date information regarding the concert series. Due to weather forecast, the Porter-Phelps-Huntington Museum will reschedule Wednesday Folk Traditions featuring Youssoupha Sidibe to a date TBD in the fall. Wednesday Folk Traditions continues August 8, 2018 at 6:30 pm with Tim Eriksen, “widely regarded as the best ballad singer of his generation” (BBC Radio), performing modern interpretations of traditional folk songs from the Pioneer Valley and beyond. Visit the museum’s website at www.pphmuseum.org, the museum’s Facebook page, or call at 413-584-4699 for the most up-to-date information regarding the concert series. Jose Gonzalez will be joined by his two sons, Rene and Ahmed, acclaimed musicians in their own right. Together, they form Criollo Clasico, a group celebrated both in Puerto Rico and the Pioneer Valley. Ahmed Gonzalez, flute, percussion, and guitar, studied classical flute at Smith College under the direction of Sue Kurian, who studied with the great Jean-Pierre Rampal. His dedication to the jazz flute led him to record and perform with several prominent Latin artists, as well as to produce his 2009 album “Flute Soul” (2009 Criollo Clasico Music). “Flute Soul” features myriad styles, from Latin to Classical to rock, all of which Rene performs with mastery and virtuosity. Rene Gonzalez, percussionist and bassist, studied music at UMass and has performed alongside world masters of percussion such as Giovanni Hidalgo, Paoili Mejias, Trilok Gurtu and Steve Berrios. His skills on congas, bongos, timbales, drumset, cajon, bata drums and his continuous studies make him a living encyclopedia of Latin percussion. Most recently, he has begun apprenticeships on electric and upright bass, performing with numerous groups on these instruments as well. Together, the family forms one of today’s finest performance groups of Puerto Rico. Afternoon tea with good company, interesting conversation, and lively music has been a tradition at the Porter-Phelps-Huntington Museum for over two hundred and fifty years. On July 7th the museum will host the first event of their summer series “A Perfect Spot of Tea.” Visitors are invited to the museum’s back veranda while enjoying a cup of earl grey tea, delicious pastries, and jazz, pop, and original instrumentals on guitar by Peter West. Admission is $12 per person. Seatings will take place at 2:30 p.m. and 3:30 p.m. For an additional fee, guests may also tour the Porter-Phelps-Huntington House Museum. Tours will be held hourly on the half hour, beginning at 1:30 pm. For more information, please call the museum at (413)-584-4699 or visit us online at pphmuseum.org. On July 7th, “A Perfect Spot of Tea” will feature musical guest Peter West. He has been playing guitar professionally since 1980 and takes his audiences on a melodious and stimulating turn through instrumental jazz, pop, and original songs. He has been giving wonderful performances at the tea series for over two decades. “A Perfect Spot of Tea” is held Saturdays from July 7th through August 18th, 2018. It will continue on July 14th with musical guest 56 String Duo, an Indian-inspired sitar and 12-string guitar duet. The series is made possible through generous donations from area restaurants, businesses, musicians, and volunteers who provide the tea, pastries, flowers, music, and service for this program. The program is inspired by the traditional teas held by the Porter-Phelps-Huntington family to bring together members of the community. Elizabeth Porter Phelps, a resident of the house from its construction in 1752 until her death in 1817, noted the teas often attracted ten to fifteen couples weekly. Visitors would “tarry” a while over a beverage that “cheers but not inebriates.” Elizabeth’s daughter even met her future husband, Dan Huntington, at one of these events. The museum invites you to come to “A Perfect Spot of Tea” and engage with communities past and present! HADLEY—Wednesday Folk Traditions at the Porter-Phelps-Huntington Museum continues on June 27th, 2018 with SayReal, a group of young musical revolutionaries who fuse reggae, rock, and traditional African drumming, featuring Northampton natives and siblings Naia Kete and Imani Elijah, and Lee John. This performance and all Wednesday Folk Traditions concerts are held Wednesday evenings at 6:30 pm in the Sunken Garden at the Porter‑Phelps‑Huntington Museum, 130 River Drive, Route 47, Hadley MA 01035. Admission is $12, $2 for children 16 and under. Picnickers are welcome on the museums grounds starting at 5:00 pm. The museum and its grounds are a smoke-free site. For further information please call (413) 584‑4699 or view www.pphmuseum.org . Wednesday Folk Traditions continues on July 11 with José Gonzalez and Criollo Clasico performing contemporary rhythms of Puerto Rico, Cuba, and the Dominican Republic. Gonzalez, acclaimed for his original compositions featuring the cuatro, will be joined by sons Ahmed, a flute sensation, and multi-percussionist Rene—together, this family forms one of the most prestigious music ensembles of Puerto Rico. The Porter-Phelps Huntingon Museum’s Wednesday Folk Traditions is funded, in part, by grants from: the Marion I. And Otto C. Kohler Memorial Fund at the Community Foundation of Western Massachusetts; the Amherst and Hadley Cultural Councils, local agencies, supported by the Massachusetts Cultural Council, a state agency; Eversource Energy, Easthampton Savings Bank, Peoples Bank, and with generous support from many local businesses. The Porter-Phelps-Huntington Museum is located at 130 River Drive (Route 47) in Hadley, two miles north of the junction of Routes 9 and 47. The Museum is open for guided tours Saturday through Wednesday from 1:00 p.m. to 4:30 p.m. The house, which remains unchanged since the family’s occupancy, tells the story of six generations of prominent Hadley residents. The family, prosperous traders turned farmers, fought in both the French and Indian and Revolutionary Wars, rose to prominence in local government, and embodied a consistently progressive social consciousness. Tours highlight both local and regional narratives, from architecture, material culture, and labor, to early-American theology, economics, women’s history and social movements. For further information about tours or other programs, please call the Museum at (413) 584-4699 or visit our website at http://www.pphmuseum.org. 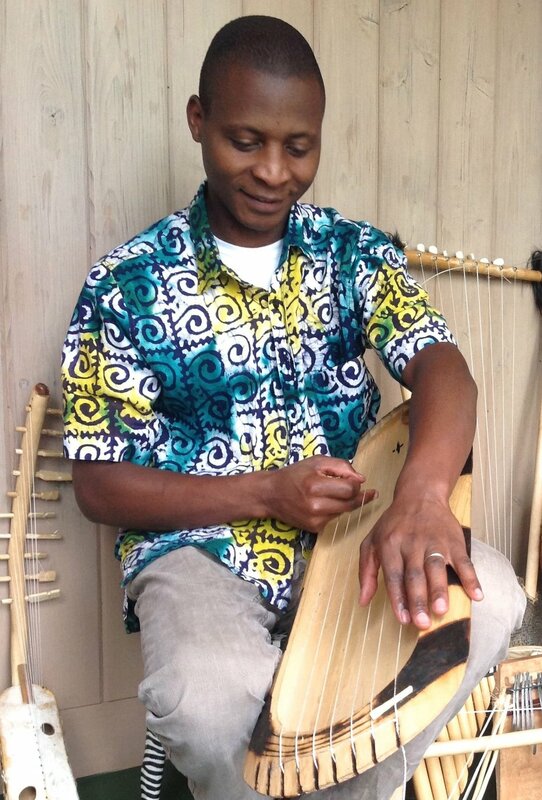 HADLEY—The Porter-Phelps-Huntington Museum continues the 37th season ofWednesday Folk Traditions concert serieson Wednesday, June 20th with the return of Zikina, featuring Uganda native Gideon Ampeire playing an exciting fusion of Ugandan folk music with contemporary influences. This and all other performances are held Wednesday evenings at 6:30 pm in the Sunken Garden at the Porter-Phelps-Huntington Museum, 130 River Drive, Route 47, Hadley MA 01035. Admission is $12, $2 for children 16 and under. Picnickers are welcome on the museums grounds starting at 5:00 pm. The museum and its grounds are a smoke-free site. For further information please call (413) 584‑4699 or view www.pphmuseum.org . Zikina seamlessly blends Gideon Ampeire’s intricate vocals and handmade instruments with rhythms and sounds from disparate cultures and parts of the world. Ampeire is joined by Mike Cardozo on guitar, Roston Kirk, bass, and Kade Parkin on drums. Building upon Ampeire’s musical and cultural heritage, Zikina weaves together intense grooves, joyous dance beats, and dreamy textures from Ampeire’s handmade East African harps, zithers, and thumb pianos. Zikina wishes its listeners to approach their music with curiosity, asking “What is that he’s playing?” and to enjoy the wide variety of sounds they’ve woven together and their interplay of traditional African music and modern sounds. Ampeire enchants audience with a range of East African instruments that he builds himself—including enanga (zither), adungu (harp), and kalimba (thumb piano). An accomplished musician, he has established himself as a master instrument maker and educator on Ugandan folk music. In addition to performing with Zikina, Ampeire has spread Ugandan folk music as the leader of Echo Uganda, playing over the Northeast United States, Canada, and appearing at the United Nations. Now, he’s joined with other Pioneer Valley musicians trained in both traditional African music as well as jazz and funk to form Zikina. Ampeire and Mike Cardozo met while studying West African drumming at Wesleyan University. They teamed up with bassist Roston Kirk and drummer Kade Parkin, to form Zikina. and to create a mix of new sonic textures that are completely new and unique. Cardozo specializes in Jazz and West African music, brilliantly bringing together a modern variety of sounds. Kirk studied film scores at Berklee School of Music, and Parkin is a versatile drummer who has studied fusion music and afro-beat; together they form Zikina’s ethereal rhythmic texture, bringing together East African beats with influence from other genres. Wednesday Folk Traditions continues on June 27 with SayReal, a fusion of young musical revolutionaries and soul-searchers who embody a strong musical lineage and ignite a vibration of Reggae, Rock and meaningful lyric that narrate the lives of those listening. Founded in L.A. by Northampton native sister/brother Naia Kete and Imani Elija they have made a mark on the national scene with Naia’s top ten The Voice appearances. The Porter-Phelps Huntingon Museum’s Wednesday Folk Traditions is funded, in part, by grants from: the Marion I. And Otto C. Kohler Memorial Fund at the Community Foundation of Western Massachusetts; the Amherst and Hadley Cultural Councils, local agencies, supported by the Massachusetts Cultural Council, a state agency; Eversource Energy, Easthampton Savings Bank and PeoplesBank and with generous support from many local businesses. The Porter-Phelps- Huntington-Museum invites all residents of South Hadley, Amherst and Sunderland o a Community Day on Sunday, June 3 from 10:00am to 3:30pm. All residents are welcome to the Museum for free tours on the half hour. Afterwards, guests can relax on the back veranda with complimentary lemonade and cookies. Members of the community are encouraged to explore the homestead and grounds of one of the founding families of Hadley and learn about the history of the Connecticut River Valley. The Porter-Phelps- Huntington Museum provides a detailed look at the role of one family in the span of over 200 years of history in the Connecticut Valley. The home, built in 1752, is preserved to its circa 1800 structure and interior décor, and houses the family’s personal belongings accumulated over generations. During a tour of the house, visitors witness the impact of historical events like the Revolutionary War, the abolition of slavery, learn more about the changing role of women, and the influence of various theological movements on local society. As the house was passed from woman to woman, unusual in its time, the museum offers an oft-overlooked perspective on women’s social roles and history over the past few centuries. A visit to the Porter-Phelps- Huntington House is a unique experience that allows guests to explore the history of New England on a personal, intimate level through the eyes of one family. This summer, Mount Holyoke College senior, Miriam Barton, is a summer museum assistant at the P-P-H Museum and conducting tours. As an anthropology major, she is “interested in the experiences and surrounding cultures that impacted the family. This family was innovative and progressive in many aspects: social movements, architecture, land usage, and more.” As is tradition, each summer museum assistant writes their own tour based on their own specializations and interests. “Everyday I get to walk around the Porter Phelps Huntington House, where there is over 266 years of rich history surrounding me,” says Barton. She hopes to see many familiar faces from South Hadley at this Community Day. Today, the house is not only host to historical interpretation, but also to weekly concerts and teas. Wednesday evenings from June 13th through July 25th, the Museum presents Wednesday Folk Traditions, an annual concert series featuring talented musicians working in a vast array of traditions, cultures, genres, and sounds, ranging from traditional American folk singers to diverse international ensembles. Every Saturday afternoon in July through August, the Museum hosts “A Perfect Spot of Tea,” where guests are invited to relax on the back porch, sample desserts and tea from local restaurants and bakeries, and listen to talented local musicians. In addition, “Massachusetts,” an exhibit by Philip Grant is on display in the Corn Barn. “Massachusetts” is a series of oil paintings on linen and canvas, completed with a unique combination of modern realist and traditional techniques. The scenes depicted of his neighbors and locations around his home of Hampden form a part of Grant’s accumulation of a visual autobiography through art. The Porter-Phelps-Huntington-Museum invites all residents of Northampton and Hatfield to a Community Day on Saturday, June 2 from 10:00am to 3:30pm. All residents are welcome to the Museum for free tours on the half hour. Afterwards, guests can relax on the back veranda with complimentary lemonade and cookies. Members of the community are encouraged to explore the homestead and grounds of one of the founding families of Hadley and learn about the history of the Connecticut River Valley. The Porter-Phelps-Huntington Museum provides a detailed look at the role of one family in the span of over 200 years of history in the Connecticut Valley. The home, built in 1752, is preserved to its circa 1800 structure and interior décor, and houses the family’s personal belongings accumulated over generations. During a tour of the house, visitors witness the impact of historical events like the Revolutionary War, the abolition of slavery, learn more about the changing role of women, and the influence of various theological movements on local society. As the house was passed from woman to woman, unusual in its time, the museum offers an oft-overlooked perspective on women’s social roles and history over the past few centuries. A visit to the Porter-Phelps-Huntington House is a unique experience that allows guests to explore the history of New England on a personal, intimate level through the eyes of one family. This summer, Northampton native and Barnard College student Cara Hudson-Erdman will be working at the PPH Museum and leading tours. As an art history major, Hudson-Erdman is fascinated by “the intricacies of the architecture and objects of the farmstead and how this family built, socialized and worked in their spaces.” As is tradition, each summer museum assistant writes their own tour based on their own specializations and interests. “I’m looking forward to giving tours this summer because I think the most special aspect of PPH is that it is a living museum-- its history continues with the interpretation of each successive museum assistant and the interactions that occur between visitors and the traces of those who lived here in the past,” says Hudson-Erdman. She hopes to see many familiar faces from Northampton at this Community Day. The Porter-Phelps Huntington Museum will present a solo exhibition of paintings by award-winning artist Philip Grant. The exhibition of portraits and scenes collectively entitled “Massachusetts,” were inspired by Grant’s neighbors and his daily walks around his home in Hampden, MA. The exhibit will be on display from June 1st to July 24th at the museum’s historic Corn Barn. “Massachusetts” is a series of oil paintings on linen and canvas, completed with a unique combination of modern realist and traditional techniques. The scenes depicted of his neighbors and locations around his home of Hampden form a part of Grant’s accumulation of a visual autobiography through art. Grant drew inspiration from Andrew Wyeth and the Dutch Masters to create images that explore scenes of nature in Western Massachusetts. Recently, Grant completed “A Portrait of Afghanistan” upon reflection of his time in thePeace Corps, and the series debuted at the Porter-Phelps Huntington Museum in the summer of 2017. Before shifting focus to paint, Grant’s career was centered in product design and development, specializing in toys and games, and the influence of this field is seen in his artistic style. As a winner of awards from the Monson Arts Council, the Piedmont show, and Agawam’s juried art show, Grant is established as a foremost oil painter in the Pioneer Valley. With exhibitions at Bing Arts Center in Springfield and the Public Library in Wilbraham under his belt, he is currently preparing a series of paintings of sthe wetlands of the Jersey Shore where he grew up. Beyond his travels in the Middle East and the natural landscape of his home, Grant cites his studies with famed abstract artist and Yale professor Josef Albers as a chief influence on his technique and style. The Porter-Phelps-Huntington Museum will be closed on Tuesday, September 12th for staff training. On Saturday, August 26 "A Perfect Spot of Tea" will continue featuring a performance by A. Burris Jenkins. Jenkins will premier some of his most recent compositions of famous classical pieces re-imagined in a jazz style.